Want to take it further? Our Fooman Order Number Customer extension provides the ability to fully customise order, invoice, shipment and credit memo numbers using any combination of letters, numbers and dates. Where can I find support for Fooman Same Invoice Order Number (CE)? Is Same Invoice Order Number multi store capable? 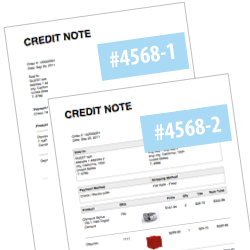 Same Invoice Order Number is fully multi store capable - simply configure different settings for each store set up. It is not working in 1.9.2.1. I deleted all my orders and tried to get this working. No luck. All new invoices start with +1 last default Magento number. If you don't update this extension please let you customers know about this issue. Downloaded it, read instructions, installed it, tested it: Works Great! I am using magento 1.6.1. I have used this extension before (older version) to fix a paypal problem that was causing an error. Exception' with message 'Wrong order ID: "200000016". This is working great for orders created from the Magento website, BUT I am also use the M2E extension for syncing with Ebay. All the orders which are being imported from Ebay are using the invoices numbers following on from the out of sync ones, not the order number. Has anyone else got this issue and if they have do you have an idea as to what to do to fix this? ?